Fresh edible flowers are difficult to find. The city of Kuala Lumpur isn't always the most connected place for rarely consumed produce. I'd have a better chance at finding it if I were back in my kampung where many people planted their own fruits and vegetables. Not many locals haven taken to eating flowers and I can guess why. Firstly, not many of us know which species can be eaten due to a lack of thorough information on the internet and anywhere else (I would appreciate it if someone could point me in the right direction!). Secondly, many of us are clueless as to which parts need to removed (if any) prior to popping it into the mouth. Thirdly, when the word 'edible' is used for flowers, does it mean that 'all' flowers can be eaten both raw and cooked? When I stumbled across these female cucumber flowers (pictured last in this post) at Ben's Independent Grocer, Publika, I didn't hesitate to grab a couple of packs to try. I felt like an excitable young child. That is, until I got home and started googling for 'How to eat cucumber flowers' . I soon had one eyebrow lifted and was scratching my head at it all! "Lord, help me. This newbie's gonna just do it like Nike!" Tossing my laptop aside, I decided that I was going to be the guinea pig, that one person who was going to take the tummy ache fall for this family. "Oh, don't be a sissy!" I lectured myself. 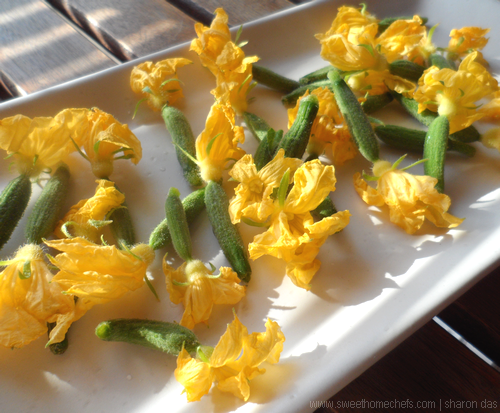 I rinsed a few cucumber flowers and ate the whole piece raw. Nothing happened and the rest, they say, is history. It was a refreshing small burst of cucumbery flavour at first bite. Pleasant on the taste buds. Since I ate this as a whole with the mini cucumber attached, I can't say what the yellow flowers taste like on its own. Curry goes well with freshly cut cool cucumbers on the side. I thought I'd use these flowers the same way. It tasted great together as I've now discovered! 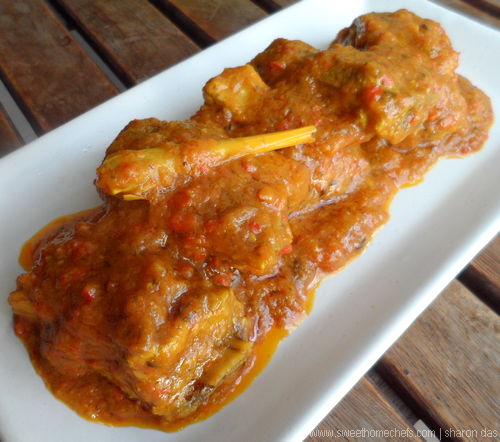 This is a sweet savoury rich curry that is best enjoyed with rice or bread. 1) Blend tomatoes, onion, garlic, red chilli and fresh coriander together with 1-2 tbsp water. 2) Heat cooking oil in pan. Saute blended mixture for a minute or so. 3) Add coriander/turmeric paste and the smashed lemongrass into the pan. Stir-fry until the ingredients come together into a thick glossy paste. 4) Add the pork. Season with sugar and a dash of white pepper. Stir for a minute or so to coat the pork pieces with the sauce. 5) Add water. Leave to simmer until the pork is cooked. Stir until the liquid is dried out into a thick curry. Season with salt (to taste). Stir and taste. Switch the heat off once you're satisfied with the flavour. 6) Serve topped with fresh cucumber flowers. 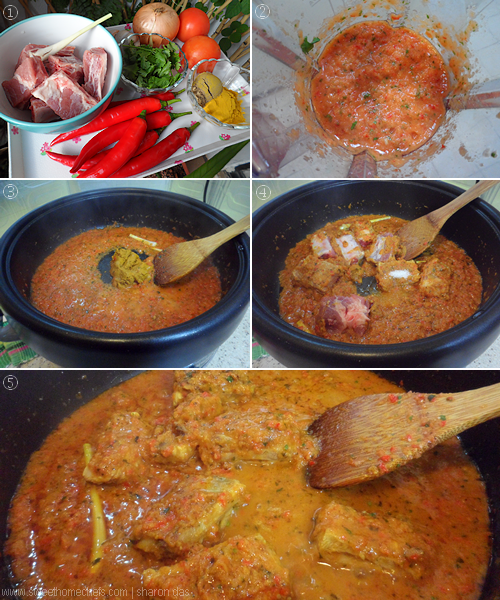 1) The ingredients for the pork curry. 2) Blended onion, garlic, chilli, tomato, coriander mixture. 3) Saute the curry paste. 4) Add in the pork. 5) Simmer, and cook until dry! This is what I call yum stuff. Top the curry with fresh baby cucumber blooms. Isn't this a pretty curry! 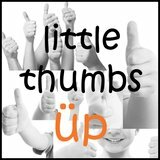 This post is linked to Little Thumbs Up - Feb 2016 which is organised by Zoe from Bake for Happy Kids and Doreen from My Little Favourite DIY, and hosted by Sweet Home-Chefs. The cucumber flowers are so pretty! The pork curry sounds so delicious! I'm always on the lookout for edible flowers and I'm so happy to read this. I never knew! That's such a pretty garnish. I have never seen them sold here. If I do grow cucumber I'd love to try this out. Curry looks rich...feel like grabbing a plate of rice! Thanks, Kanak. I'm dying to try some of the edible flowers you shared on your page too, but it's impossible to find here! I imagine how the little cucumbers taste like. But I assume it blended well with the taste of curry. Yummy. I love curries and cucumbers. I will plant it when I move to the mini farm. 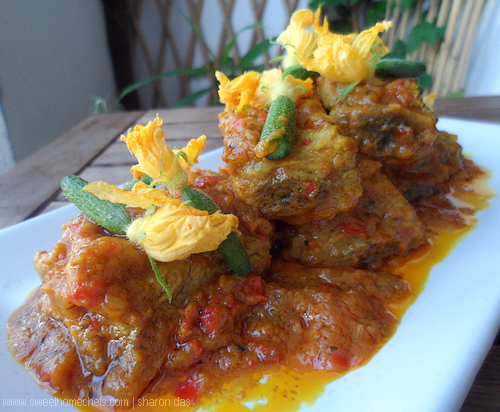 Have never seen those cucumber flowers...the curry looks very tasty, Sharon. The curry and the cucumber blossom both are pretty! Your curry has me drooling! Looks great with the cucumber flowers. I am interested in edible flowers also but so far do not have the proper knowledge and courage to try out. Let's learn together, Nancy. I need the courage too ..haha! I am always worried about new food going into my stomach! Cucumber flowers are pretty. I never seen it before. Or maybe I didnt knew what it was till now. Nice pork curry. I could do with a serving right now. Hehehe. OMG, I want those cucumber flowers! I've never seen anything like these before, Sharon! Me neither, Shirley - at least not until this! So glad I was more observant this time around whilst marketing! Dear old me a "mountain tortoise" as I've never seen/heard cucumber flowers before ... very pretty flowers!